The greatness & power of the Almighty God are unfathomable. He is greater than any other force or being. His might is unparalleled. Our God is greater than any other force or being. And, He is greater than all that pertains to us. Our God is wiser than the wisest of men or spiritual beings. If we could grasp the greatness of our God and figure out all of His ways, He would fail to be God at all for He would be no greater or wiser than our understanding. But, with unfathomable greatness and wisdom, we have an infinite God who “is able to do immeasurably more than all we ask or imagine, according to his power that is at work within us” (Eph. 3:20). We find verses in Scripture where God’s greatness and might accompany His wisdom and understanding. This essential combination brings reassurance for we can know that we have a God who will exercise His might with wisdom. Creation of the Heavens and Earth: Think about the chaos had God merely brought things into existence without exercising wisdom so all the variety fit together in a coordinated and good functioning design. Conclusion of the Heavens and Earth: Think about the judgment God would bring if only exercised by His mighty wrath and not accompanied by wisdom. All would undoubtedly be annihilated in the blink of an eye. His wisdom, however, bridles His great power so as to allow for the salvation of all who would come to Him. Certainly if God is greater than all other forces, natural and supernatural, He is greater than all that pertains to you! We will never fully comprehend the magnitude of “his incomparably great power for us who believe” (Eph. 1:19). But, as we grow into a deeper understanding of how great He is, we will gain a peace and confidence to face whatever comes into our lives. The above Scripture verses speak for themselves about the difference it makes when we truly believe God is greater than all that pertains to us. Like the psalmist, we may acknowledge and praise God for His greatness. To truly be GOD, wouldn’t He have to be the one of whom there is none greater? God is greater than all other forces, natural or supernatural. When we acknowledge that God is greater than any of these forces, it changes our whole perspective about His rights and sovereignty. We find ourselves submitting to Him and trusting Him to do what’s best. Though we may not understand why He allows what He does in this world, we rest in the confidence that in the end He triumphs over all. We don’t have to understand everything to trust Him. 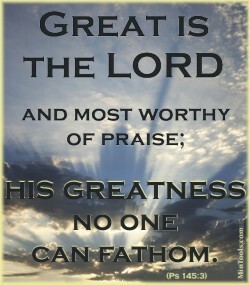 He is GOD, the One of whom there is none greater! Scripture is filled with verses and examples of the power of God at work in and through His people. Below are three passages from which we can pull out some wonderful truths about God’s power. — The character or essence of the Almighty God of whom there is none greater is that on which we rely. — We have all we need and then some … a limitless amount of power. — The basis we should use for determining possibilities is what He does, not what we do …. who He is, not who we are. — He uses His power to work both in us and through us in all areas of life. — The credit goes to Him, not us, because it was His power at work, not us. We cannot begin to comprehend all God wants to do in and through the church. To think that an Almighty, infinite, eternal God would work through weak, finite beings is mind boggling. Let’s not take it for granted. It will affect your confidence level in ministry. If your God doesn’t seem all that great to you, why not rely on yourself or others to do the work? But, if you do that, don’t expect a whole lot to happen. Ministry accomplished by finite beings, yields little. However, if you view His greatness as so vast that you can’t even begin to fathom it, you will “trust in the Lord with ALL your heart and lean not on your own understanding” (Prov. 3:5). Then you will be able to step out in confidence, knowing that with His wisdom guiding you and His power enabling you, much will be accomplished that will count for eternity. It will affect your enthusiasm or passion in ministry. An anemic God doesn’t give us much to get excited about. However, with a God whose greatness can’t even begin to be fathomed, all sorts of possibilities and potential in ministry open before us and that keeps the spiritual adrenaline pumping. This is a God who is “able to do immeasurably more than all we ask or imagine, according to his power that is at work within us” (Eph. 3:20). Death seemed to point to a weakness in Jesus’ claims to be more than a man. Being raised from the dead, however, took divine power. See 2 Corinthians 13:4. 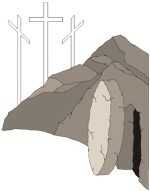 Consequently, Easter’s power confirms the identity of Jesus as the Son of God. If He had remained dead, He would be no greater than mankind. He would not have accomplished salvation. But, having power over death and the devil, Jesus proved Himself to be the promised One. Ephesians 1:19-20 speaks of “his incomparably great power for us who believe. The Power of God that raised Jesus from the dead is available for us today. Let’s be careful that we don’t think we can take something wrought by the power of God, and perpetuate it by human wisdom and effort.